Hydraulic fracturing, or fracking, is a high-pressure technique for cracking rocks and allowing natural gas to reach wells. Amid a boom in U.S. natural gas production, industry promises that fracking will bring Americans jobs and low-cost energy for decades. Opponents warn that the drilling-and-fracking process threatens to pollute air, surface water, and most importantly, groundwater. Will these concerns stymie an ongoing boom in natural gas production? Should they? When opponents talk about an “industrial landscape,” this is what they have in mind. This equipment, in Pennsylvania, will be moved after drilling and fracking is finished. 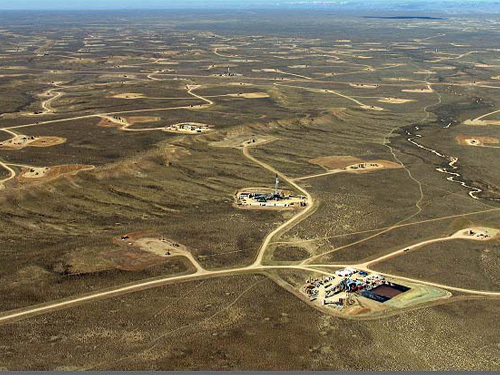 Review: What exactly is hydraulic fracturing? Why is fracking becoming popular now? What is the difference between unconventional and conventional gas? What are the environmental and economic costs and benefits of fracking? Discuss: In terms of costs and benefits, how does unconventional gas compare to coal, wind, nuclear and solar energy? Source your energy. Students will investigate what turns on their lights with this lesson plan, funded by the American Petroleum Institute. Does natural gas power your community? Grades 6-9. The pros and cons. Students will explore the merits and pitfalls to many sources of energy through this activity. Grades 6-9. Case study. This lesson packet has students investigate the Marcellus Shale situation. It contains activities for elementary, middle and high school levels. A bigger picture. This interactive website helps students explore the larger landscape of energy in our lives. Grades 5-10.